This is the story of a great love, connection of times and generations. Beauty Clarence lives in the cold mountains. One day she finds a mysterious letter and decides to find out the truth about her father's past. The girl is sent to the island of Fernando Po, as if goes to heaven. She follows in the footsteps of family secrets, and where there is a forbidden love, betrayal, and the great events that have become a part of world history. Romantic, Drama. 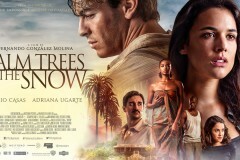 Cast: Mario Casas, Berta Vázquez, Adriana Ugarte Just watched this movie on Netflix with my family, I super recommend it .warning this movie will make you cry! Such a beautiful story and very well directed.